Write or edit a line or two of code. Hit the browser’s refresh button. Return to step 2. Then repeat — in multiple browsers on numerous devices using a multitude of test methods. How many hours did this incur during the past year? Modify a file and your page will reload in all browsers. CSS is re-injected so the full page doesn’t need to be refreshed. Your scroll, click and form actions are mirrored across every browser. This is especially useful when testing mobile devices; you can modify an input field on your desktop and the same string will appear on all attached phones and tablets. Goodbye on-screen keyboards! You can choose which actions are mirrored. 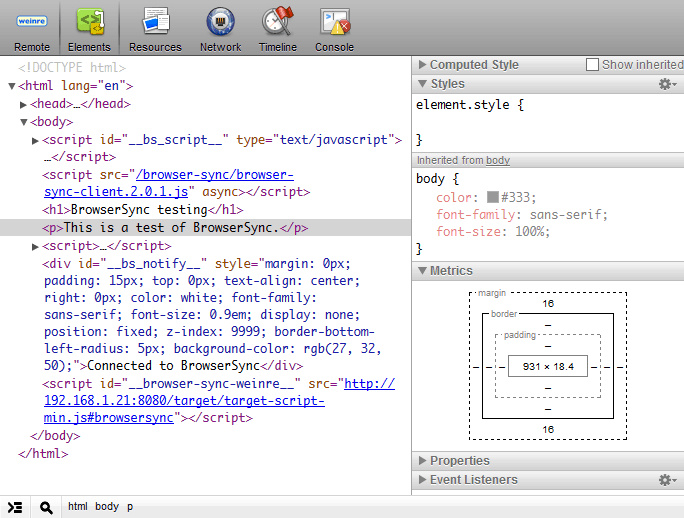 You can debug pages remotely using the Chrome Inspector-like weinre (WEb INspector REmote) tool. Throttle the response time of all files to discover how the site will be perceived by those on slower connections. Your browsing history is recorded so you can push a test URL to all devices instantly. 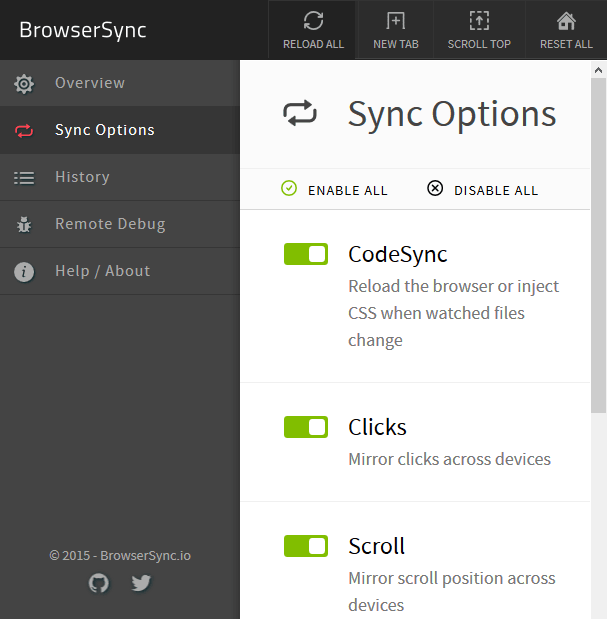 As well as the command-line, you can now control BrowserSync from a web-based user interface. You can run BrowserSync on its own but I normally deploy it using Gulp. It’s also compatible with Grunt and many other task runners. BrowserSync is open source and works on Windows, Mac OS and Linux. Installation takes minutes and, unlike some alternatives, there’s no need to install browser plug-ins or additional software. BrowserSync starts a small web server. If you’re already using a local web server or need to connect to a live website, you can start BrowserSync as a proxy server. It injects small script into every page which communicates with the server via WebSockets. When an event occurs — such as a file modification or scroll action — the server sends an update notification to all connected devices. But you don’t need to worry about any of this; BrowserSync just works and you’ll be the envy of your peers (or accused of witchcraft). Depending on your set-up, Mac and Linux users may require sudo at the start of that line. browser-sync start --server --files "*.html, css/*.css"
You can enter the “External” address in the location bar of any browser on your network, i.e. http://192.168.1.21:3000. This will load your default page (index.html) and automatically refresh it when the HTML or CSS changes. The control panel can be loaded in your browser with the “UI External” address (http://192.168.1.21:3001). The panels allow you to check settings, change synchronization options, view/push the page history, initiate remote debugging and reload all attached browsers. Many other options are available from the command line. Refer the website at browsersync.io for examples or consult the full documentation. Spend half an hour playing with BrowserSync today and you’ll wonder how you ever worked without it. This was really good, Craig! Useful for UX testing as well as development. BrowserSync is fantastic, but I cannot get it to work with the enterprise PHP application at work. All the public pages work, but when I try to login only one browser gets "inside". Which browser can successfully login is a random timing issue, so the first one (or last one?) to send the login request wins. I think that the problem is the session handling that relies on cookies, because every browser gets a different session cookie. It would have been awesome if BrowserSync in proxy mode would synchronise the cookies between browsers. I found a closed issue on Github issues page, but it doesn't work for me. @ceeb, have you experienced problems like this or do you have an idea how to solve this? I actually released something similar a couple of months ago: https://github.com/TomBZombie/NoF5 Mine takes it a step further and also reloads the page when an .php, .tpl, .xml or any other file that's required to generate the page is modified... it also doesn't use a browser addon, you just include the .phar file in your php script on the server and it just works. That looks good, Tom. I think BrowserSync can follow any file type too - I just used HTML and CSS in my example. Nor does it use a browser addon - it just inserts a small script into your page (automatically or you can do it manually). You're cruel guys... Do you know how much stuff is out there that you make me want to try? I don't have time for everything !